Gun Runner closed out 2017 with four straight grade 1 wins. It’s not supposed to be easy—not at the stage of his career Gun Runner was running headlong into at the start of 2017. As the stakes are raised and the competition elevates in Thoroughbred racing’s handicap division, those at the head of the line usually show some signs of the toll necessary to keep the challengers behind them. Throughout the year, however, Gun Runner kept proving the usual standards didn’t really apply to him. His margins of victory kept increasing. The manner in which he achieved his triumphs kept getting faster. Following his supposedly hardest efforts, he displayed the demeanor of an indefatigable worker ready to pack up his lunch pail and straight away get back to business. 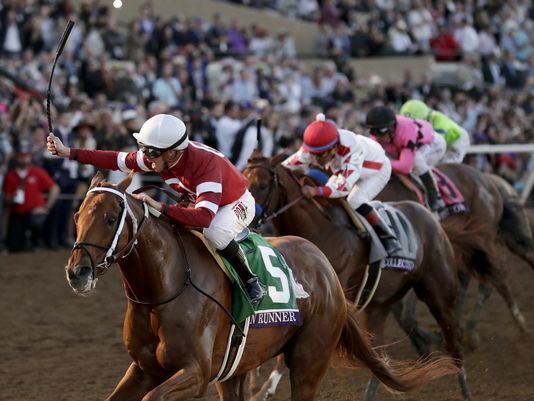 On Jan. 25, Gun Runner notched another career-defining victory in runaway fashion. As was expected, following a campaign that saw the son of Candy Ride rattle off four straight grade 1 wins—including his 2 1/4-length triumph in the Breeders’ Cup Classic (G1)—Gun Runner was crowned the 2017 Horse of the Year at the 47th annual Eclipse Awards ceremony held at Gulfstream Park. In equally dominating fashion, Gun Runner also claimed the trophy for champion older dirt male, with both honors being mere formalities in the wake of a season that saw the then 4-year-old give a clinic on progressive improvement. When Gun Runner ended his 3-year-old campaign by defeating his elders in the 2016 Clark Handicap (G1) at Churchill Downs to earn his first top-level victory, it hinted of the upside to come as he transitioned to the older horse ranks. His first major test would be maintaining his form without a proper race outlet. He was forced to miss the 2017 Pegasus World Cup Invitational Stakes (G1) following quarantine restrictions put in place at Fair Grounds Race Course & Slots as a result of an outbreak of the equine herpesvirus. Once his season finally got going with a glorified workout in taking the Razorback Handicap (G3) by 5 3/4 lengths last February, the only thing that stymied Gun Runner the remainder of the way was an incredible effort from a champion rival. His run in the Dubai World Cup Sponsored by Emirates Airline (G1) last March would have likely won most editions of the race, but it was second-best to Arrogate that night as that one unleashed a last-to-first rally that had many convinced the Horse of the Year race was all but a walkover. They weren’t wrong. They just pegged the wrong winner. Where Arrogate’s best form never returned following that stirring evening in the desert, Gun Runner proceeded to morph into his best self. He followed his seven-length win in the June 17 Stephen Foster Handicap (G1) with a 5 1/4-length canter in the Whitney Stakes (G1) at Saratoga Race Course. Lest anyone think the demands of his ambitious season was taking anything out of him, Gun Runner uncorked a 10 1/4-length victory in the Woodward Stakes Presented by NYRA Bets (G1) in September to put his Horse of the Year destiny in his own hands heading into the Breeders’ Cup. “We always felt like he would come into himself at some point … knowing that family line gets a little better later, we had a little bit of this anticipation,” Winchell said. Bred by Besilu Stables, Gun Runner is out of Quiet Giant, by Giant’s Causeway . The Edward P. Evans-bred Quiet Giant won the grade 2 Hill ‘n’ Dale Molly Pitcher Stakes at Monmouth Park in the summer of 2011 and sold for $3 million later that year as part of the Evans dispersal. There was unfinished business for Gun Runner to attend to in the Breeders’ Cup Classic, namely that he had yet to win going 1 1/4 miles or beat Arrogate in a head-to-head matchup. Those last couple of barriers fell like dominoes over the Del Mar track Nov. 4 as Gun Runner took all the heat from grade 1 winner Collected up front and never so much as blinked. The handicap division indeed had its undisputed king and Hall of Famer Asmussen had a third Horse of the Year protegé to go along with Curlin (2007-08), and Rachel Alexandra (2009).